The bar is set, you’ve picked out a bottle or two of the finest vodka or your best whiskey. The glasses are sparkling and you’re looking forward to winning your guests over like the perfect host or hostess that you are. But you’ve also done this too many times and you’re wondering if there’s anything you can do to set your bar higher when it comes to entertaining. Two words: crafted cocktails. A well-made cocktail is a work of art. Not only does it add flair to your party, it also tells your guests a thing or two about your tastes and the fact that you’re willing to make more effort than just pouring out some wine or whiskey. Cocktails are fun, they can be personalized to suit the mood and theme of an evening. Planning a lazy brunch? Get hold of a trusty mimosa recipe and watch your guests’ smiles light up your afternoon. For an evening do, turn to whiskey sours or a classic margarita and your guests will be pleased as punch. 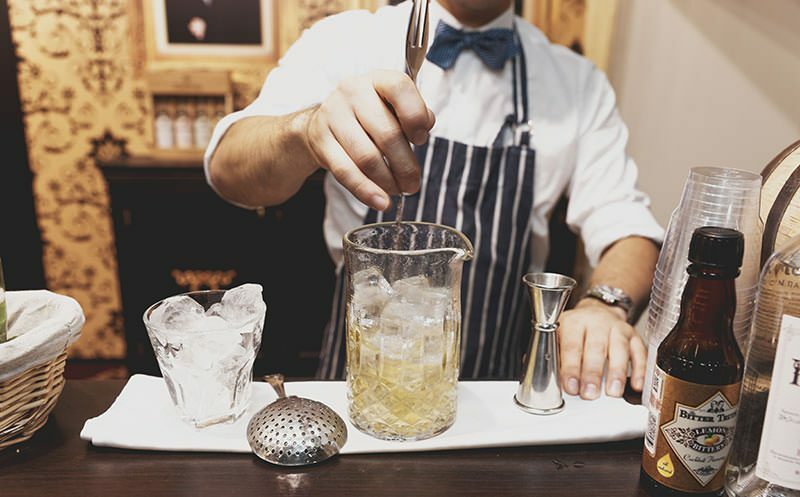 Unless you aspire to pull off theatrics and party tricks like a professional bartender, mixing cocktails is no biggie. It’s a fair bit of work, yes. You’ve got to understand your spirits and flavors really well, but with that and some practice on your techniques, you’ll be able to mix up a few basic cocktails easily. Provided you have the right equipment, though. A bartender’s arsenal has some essential tools, and while you might be more familiar with the ubiquitous cocktail shaker, you’ll be amazed when you discover the mixing glass. Yes, a cocktail mixing glass is every bit as essential to a bartender’s set as a shaker is. Cocktails can be stirred or shaken, although a certain Mr. Bond certainly made the latter far more popular. Whether a cocktail is made stirred or shaken, depends on the ingredients and flavors used in it. Essentially, shaking is a more rigorous mixing process, and you’ll find that cocktails that call for cream, dairy, liqueurs, sour mixes, fruit juices or pulp will usually be shaken. Think of a cosmopolitan, or a martini – they’re always shaken so that all the flavors really mix up properly, and you get a more well-rounded taste because of all the air that gets added to the cocktail. Stirring, on the other hand, uses a mixing glass and spoon, and is a gentler, simpler method that lets you taste the original flavor of the liquor. Stirred cocktails usually have simpler ingredients (like a Manhattan) and tend to be more prominent in terms of the liquor flavor. While you’d be tempted to think that shaking needs a proper cocktail shaker but you can stir up a cocktail in pretty much any glass, that’s not the case. You’re going to be building your cocktail, ice and all in this glass, so it’s important to pick the right mixing glass for your bar. Stainless steel or sturdy glass, both are safe bets for mixing cocktails. While stirring is a gentler process than shaking, you’re still going to be using a bar spoon inside the glass, and a glass that cracks easily is going to give you a lot of trouble. Basically, you want a glass that is thin enough to chill the cocktail really quick, but thick enough to withstand the stirring. Bartenders tend to favor glass over steel, since you can see your cocktail as you build it up that way. The ideal shape of a mixing glass is one that is wide enough for you to be able to move around the bar spoon comfortably, but also large enough to comfortably hold one (or two) cocktails at a time. It’s important that your glass is the right width – too narrow and you won’t be able to stir properly, too wide and it will cause your drink to spill while stirring. Mixing glasses are either plain or etched on the outside, especially the ones made of glass. Apart from making the glass look really elegant, the etching also adds texture to the outer surface of the glass, giving you a good grip when you’re pouring the drink, reducing the possibility of your glass slipping and breaking (all that effort gone to waste, you wouldn’t want that, would you?). This is probably the most important part about choosing a mixing glass and also the reason why just about any other glass won’t do. A good mixing glass has a heavy, solid base which prevents it from toppling over while you’re stirring. A glass made of sturdy stainless steel or glass with a weighted base is perfect. With these factors in mind, it’s really easy to pick the right mixing glass. You can try your hand at choosing from some really good mixing glass options that are lined up below. After that, it’s you and your bartending skills, taking your guests’ breath away. This is a classic, Japanese-style cocktail mixing glass, made from sturdy glass. With a heavy, solid base and a height that is just right to stop your drink from spilling as you mix it, this is a great choice for home bartenders and professionals alike. Weighted base prevents glass from toppling over. Slightly expensive as compared to similar products. 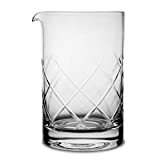 The Japanese-style cocktail mixing glass from Kotai can be purchased online at Amazon. For the price, our editors think that this is an expensive but elegant addition to your bar. If it fits in with your vintage bar as well as your pocket, give it a try. Our editors think that this is the cheapest cocktail mixing glass on the market right now, but it’s just as good as the others. Not only is it sturdy and nice to look at, it also comes with a pretty neat bar spoon, so you can get started on that cocktail right away! Ultra clear lead-free glass makes it easy to see your drink as you build it. Wide mouth and base for easy stirring. Beaker-like spout gives you a smooth pour. Thick-walled glass and sturdy base. 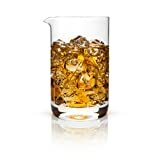 Amazon is where you can buy the Hiware cocktail mixing glass. An absolute gem of a buy, whether you’re a home bartender or a professional. 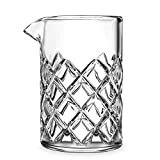 You’ll love this glass for its sleek, elegant yet sturdy finish, and so will your guests when you use it to whip up some delectable drinks for them. This is a smaller cocktail mixing glass that comes with an attached strainer. It has sturdy, thick walls and a wide mouth that allows you to stir your cocktail evenly. With a classic Japanese-inspired design and a good grip, this strainer is great for smaller parties or for a romantic cocktail evening. 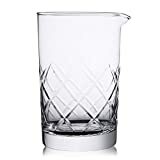 You can easily purchase the Final Touch 400 ml cocktail mixing glass at Amazon. If you’re someone who likes mixing cocktails for one or two people, then this is the perfect glass for you. The strainer will save you the trouble of looking for a separate one, and the elegant design will definitely add to the charm of your bar. If you’re thinking of using this for entertaining a group, though, maybe you’re better off with a bigger mixing glass since this glass might work out to be too small, but also a tad expensive compared to some other options on the market. Now that you’ve figured out which cocktail mixing glass to buy, it’s time to play bartender, master a few classic recipes and stir up a storm with your new mixing glass. Cheers!